Gillette's Kennedy Schomer loses the ball in a challenge with Buffalo keeper Maddy Killian Thursday afternoon during the Camels' 10-0 win over the Bison at CCHS South Campus. Sturgis Scoopers pitcher Caleb Bates throws a pitch to the Gillette Roughriders Thursday night during the Riders 7-0 season opener at Hladky Memorial Stadium. John Bozovich crosses the finish line in the first heat of the boys 400-meter dash Tuesday afternoon during the Camel-Bronc Dual at CCHS North Campus. Gillette's Abby Moerkerke boxes out a Natrona's Abby Ellbogen as the Camels score during the championship game against Natrona County Saturday March 12, 2016 at the Casper Events Center in Casper, Wyoming. Gillette beat Natrona 84-62 to win the 4A state title for the second year in a row. Travis Nelson of Philip, South Dakota, rides saddle bronc on Friday during the first night of the Coors Pro Rodeo at the Cam-plex East Pavilion. Cheyenne South's Joshua Anderson swims the 100 yard backstroke in 1:35.10 Friday during the Sheridan Boys Pre-Invite Friday at the Campbell County Aquatic Center. Sheridan's Jakob Eckard won the event with a time of 59.96. Gillette wrestler Anthony Alcon wrestles Laramie's Ryder Gill in the 120-pound weight class during Friday's 4A East Regional state wrestling tournament at CCHS South Campus. Gillette's Beth Sutter goes up for a shot Wednesday night during the Pronghorns win against Little Big Horn Collegeat CCHS South Campus. Ian Cohoon swims in the second heat of the 100-yard butterfly Thursday afternoon at the Campbell County Aquatic Center in Gillette. Cohoon came in fourth in his heat with a time of 1:02.3. Gillette senior Dalton Holst drives to the basket Friday night during the final regular season game against Sheridan at CCHS North Campus. Holst lead the team with 17 points, helping the Camels beat the Broncs 72-66 in overtime to finish the season 8-2, second in the East. Gillette's Michael Cunningham wrestles Laramie's Arsenio Lemus in the 120-pound weight class during 4A East Regional wrestling tournament Friday as CCHS South Campus. Gillette senior Jessie Geer drives past Sheridan's Robbie Ryan Friday night during the Camel's 63-51 win over the Broncs at CCHS North Campus. The Wyoming rivals Geer and Ryan have both committed to playing Division I basketball next year, Geer at Utah State and Ryan at Arizona Sate. Gillette freshman JR Albers swims in the consolation heat of the 100-yard backstroke Saturday afternoon during the 4A state swim and dive championships at the Campbell County Aquatic Center. Albers finished with a time of 59.42 while fellow Camel freshman Gunnar Poley finished first in the state with a time of 53.79. Gillette College guard Nakedra Burke goes up for a shot Thursday night during the second half of the Pronghorns 67-61 win over the Western Wyoming Mustangs in the Reigon IX tournament at CCHS South Campus. The Pronghorns will move on to face McCook Community College in the semi-finals Friday night at 7 p.m.
Gillette's Logan Myers celebrates as he crosses the finish line Saturday as the boys 4x400 team wins first place at the 4A Indoor Track Championships at the Recreation Center Field House. Gillette senior Jessie Geer brings the ball up the court Friday against the Natrona Fillies during the Camel Invite. The Fillies beat the Camels 57-55. Jackson's Rachel Ablondi takes her second of three dives Friday at the Class 3A Girls State Sim and Dive Championship in Gillette. Ablondai came in 1st overall with a score of 303.20. Alicia Clouston with Gillette Physical Therapy attends to Gillette Wild forward Michael Doyle on the ice after Doyle took a stick to the face, causing a cut to his upper lip, on January 1, 2016 at the Spirit Hall Ice Arena. Doyle walked off the ice but was transported to a medical facility to receive further treatment. The Pronghorns bench celebrates as Taylor Deaton ties the game late in the fourth quarter Wednesday night at CCHS South Campus. The Pronghorns went on to beat the Sheridan Generals 54-51. Justin Nelson from Rapid City, South Dakota, looks at the brackets Saturday for the grappling portion of the Wild West wrestling tournament at the Wyoming Center. Gillette's Troy Green, left, celebrates as the Gillette College Pronghorns extend the lead late in the second half Wednesday night against Little Big Horn College. Gillette swimmers celebrate their state title Saturday afternoon after diving into the pool at the aquatic center. Gillette was awarded with head coach and assistant coach of the year for coaches Josh Bott and Adam Miller respectively. Gillette's Beth Sutter cuts a piece from the net Saturday night after beating Casper College 78-68 to win the Region IX championship at CCHS South Campus. Gillette senior Dalton Holst, left, watches the Camel girls play in the semifinals of the girls 3A state basketball tournament Friday night at the Casper Event Center. Gillette beat Cheyenne East 58-46 and will play Natrona for the title Saturday evening. Gillette cheerleaders hug after performing at halftime of the semifinal game of the girls 3A state basketball tournament Friday night at the Casper Event Center. Gillette beat Cheyenne East 58-46 and will play Natrona for the title Saturday evening. Cheyenne Central cheerleaders cheer during the final minutes of the 4A state basketball championship March 12, 2016 at the Casper Events Center in Casper, Wyoming. Cheyenne Central beat Cheyenne South in overtime for the state title. Gillette Kalina Smith ices her nose after getting hit in the face during the second half of the championship game against Natrona County Saturday afternoon at the Casper Events Center in Casper. 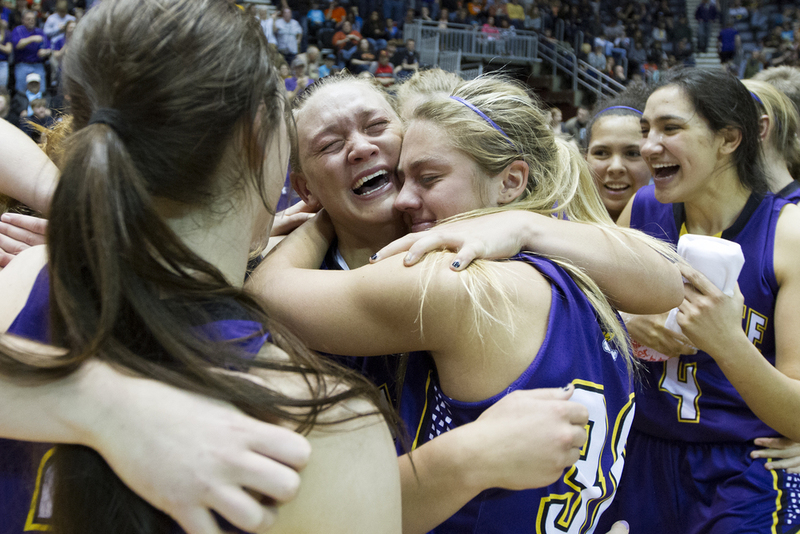 Gillette beat Natrona 84-62 to win the 4A state title for the second year in a row. 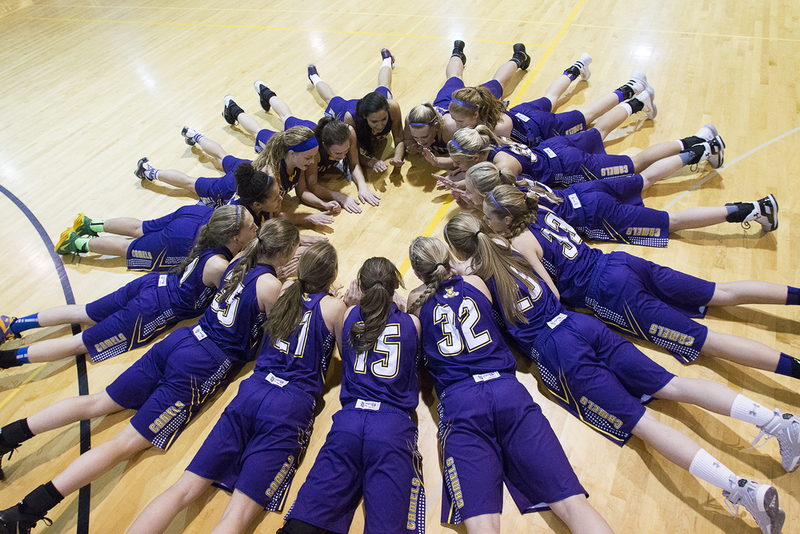 The Campbell County High School Camels circle up on the court Friday before their game against the Natrona Fillies during the Camel Invite. The Fillies beat the Camels 57-55.